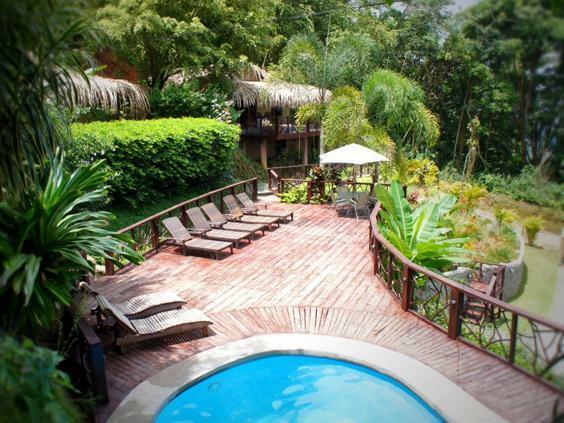 ﻿ Best Price on Terrazas de Ballena in Uvita + Reviews! Secluded in the rain forest and offering a sun terrace with swimming pool and views of the Whale's Tail, Terrazas de Ballena is located a 10-minute drive away from Marino Ballena National Park's beaches. Each bungalow offers a terrace overlooking the pacific with beach chairs, air conditioning and a fully equipped kitchenette. Breakfast and WiFi are included. This eco-friendly property is a 2-minute drive from the town of Uvita where guests can find a variety of restaurants, supermarkets and shops. Juan Santamaría International Airport is a 3-hour drive away. Please note, in order to get to the Terrazas de Ballena, the hotel recommends using a 4x4 type of a vehicle.